The Best in What's Next at SXSW » Candidate Resources Inc.
South by Southwest, the music and tech event dedicated to helping creative people achieve their goals is expected to draw over 50,000 visitors to the Austin area this March and once again set the tone for emerging trends across major industries. The festival has grown exponentially since its humble beginning in 1987 and can provide a useful model for evaluating the employees and management considerations of the future. “SXSW’s 2018 economic impact on the Austin economy totaled $350.6 million,” according to the official 2018 SXSW economic report. People traveled from all 50 states and over 100 different countries for the event, bringing a diverse mix of ideas to the area. With such a city-wide financial spike also comes sharp job-seekers. Human resource departments in particular should take heart at the influx of talented candidates this event generates. 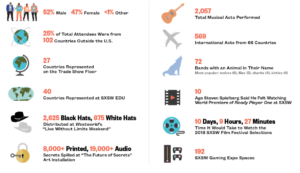 “So far, we’ve seen the growth of SXSW correlate almost one-for-one with the growth of the economy in the city,” reported Michael Sury, a financial instructor at the University of Texas. The effects of these proceeds are felt long after the event wraps up each year. 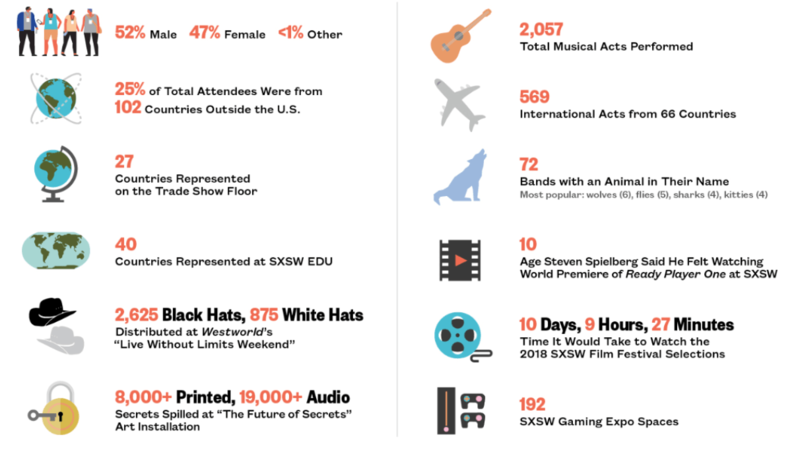 In the second half of 2018 alone, multiple companies were poised to move their headquarters to the city, in part because of the progressive culture SXSW represents. The area now boasts over a dozen promising startups to watch in 2019, reflecting the youthful innovation the fest bolsters. While the festival is well-known for live music, it also features technology conferences under an umbrella called SXSW Interactive. In fact, in 2010, for the first time, there were more SXSW Interactive attendees than concert registrants. One company that may have never made it without SXSW? Twitter. Back in 2007, the startup exploded onto the scene thanks to a standout marketing campaign throughout the fest. Since then, thousands of other entrepreneurs and tech experts have benefitted from similar investments. This year, tech giants at the conference are set to explore everything from the role of Cryptocurrency in your company, to Marie Kondo-ing your brand’s design. Keynote speaker Melinda Gates will share her opinions on diversity, inclusion, work-life balances, and more in today’s competitive markets. Joining her are TaskRabbit CEO Stacy Brown-Philpot, celebrity attorney Nina Shaw, and Hearst Magazine Chief Content Officer Joanna Coles. HR professionals aimed at staying ahead of the curve are sure to benefit from the insight of these industry leaders. Another panel focusing on “how employers can create inclusive, safe and productive environments” is titled “Employees as Catalysts for Corporate Change”. There’s no better time than now to encourage employees to help create a work culture that benefits everyone equally. Centering the causes they care about—through volunteer days, safe spaces within the workplace, and individual activism—can boost employee retention and productivity. Such forums show that SXSW participants will not only be looking for fun—they want to work for cutting-edge companies who meet them where they’re at. 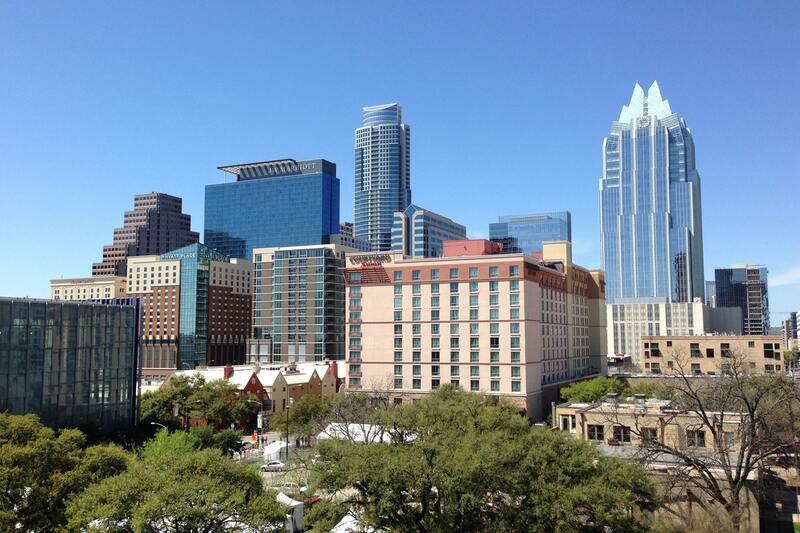 In these ways, SXSW offers a head-start for companies willing to keep up with the times. Knowing that young professionals from across the world will be in your city, what can businesses do to reach potential recruits? Get creative. Connect over music. Discover what the generation you’re hoping to hire is listening to. Find ways for your marketing to take on a musical note. People are inundated with commercials both at and beyond SXSW, so whether you advertise online or on billboards, make your message loud and catchy. Get involved. Consider joining events that attract your target hiring market. Engage potential candidates by being present in a variety of settings in which they can learn about what you have to offer. Having someone on the ground and in the action is a great way to gain traction. Get educated. Follow hashtags of popular events in your area to learn about—and interact with— trends, opportunities, and breaking news. Understanding the zeitgeist of relevant occasions will be key in attracting and keeping world-class candidates. Just as businesses often advertise their services during the fest by using the hashtag #SXSW, you can utilize market-relevant hashtags to snag the attention of tech-savvy candidates. Get smart. Once word is out and the resumes start pouring in, don’t forget to continue using tech to find the right fit. While both traditional and tech-forward recruiting methods are important, the only way to confidently make the final hiring decision is with an objective, unbiased assessment. Understanding employee motivations and emerging trends in the candidate pool are tremendous benefits of personality assessment and benchmarking. Like SXSW, CRI has stood the test of time by consistently discovering the best in what’s next. Since launching in Dallas in 1957, we have championed local businesses both big and small, helping them adapt to hiring challenges and opportunities. Contact us today for more tips on maximizing your hiring processes today.